Clenching/grinding and impact sports often result in irreversible tooth damage and wear. We will work with you to determine how to protect your teeth from harm, usually by wearing a custom made bite appliance. Clenching and grinding of your teeth, or bruxism, is a condition that affects many people. If you are waking up in the morning with sore teeth or jaws, or have frequent unexplained headaches, you may be grinding or clenching your teeth in your sleep. Bruxism can gradually wear down your teeth and cause serious damage that can be very difficult and expensive to repair. Sometimes the teeth can become so badly worn that they have to be extracted. A custom bite appliance not only protects your teeth from wear, but helps to quiet the chewing muscles active during grinding. Your teeth can be chipped, broken or knocked out in any sport that has the potential for impact. While sports guards are a necessity for sports like football, your teeth could be damaged in any sport by collisions with other players, falls, and other impacts. 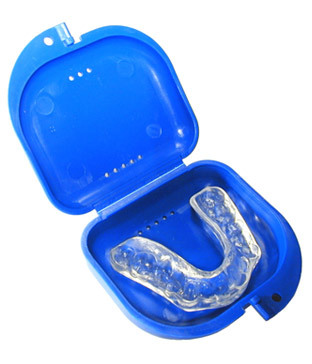 A custom made sports guard fits your mouth much better and more comfortably than a store-bought guard so you can defend your teeth from injury without losing focus on your game. If you want to protect your teeth from injury, give us a call today to schedule a consultation.